Reliable transit and safer streets in San Francisco and the Bay Area could be crippled by what U.S. Secretary of Transportation Ray LaHood has called “the worst transportation bill [he’s] ever seen” making its way through the U.S. House of Representatives. As Streetsblog Capitol Hill has been reporting, H.R. 7, the federal transportation bill being pushed by House Republicans, would be disastrous for transit riders and crippling for programs that fund pedestrian and bicycle safety. Cities throughout California are dependent on a robust multimodal, accessible transportation system. Maintaining mobility in our communities is fundamental to our overall economic vitality, getting people to their workplaces, daily appointments and to downtowns for shopping. We’ve seen that cities, particularly those in California, continue to drive our nation’s economic resurgence. To choke off our most important resource for transportation infrastructure would be devastating to our recovery. We mustn’t stay silent as the House considers this legislation. 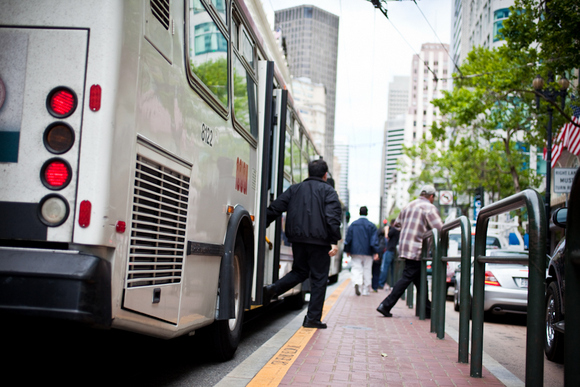 “At a time when Muni needs over $7 billion just to mantain a state of good repair over the next generation, it could see devastating cuts — hundreds of millions over the next five years — to funding that now goes to maintain their system,” said Cohen. “Some of the Bay Area’s most innovative programs are currently funded by federal sources,” said Cohen, including the Metropolitan Transportation Commission’s Transportation Climate Action Campaign, which will fund projects like regional bike share. Improvements for safer bicycling and walking would also lose all dedicated federal funding under the bill, which has been expressly opposed by the San Francisco Bicycle Coalition and Walk San Francisco. SFBC Deputy Director Kit Hodge told the Examiner that the organization is “appalled” by the proposal. H.R. 7 was recently split into three separate bills, and the latest reports indicate the House may not vote on the transportation component until after the President’s Day recess — a sign of weakness but far from a guarantee that the bill will fail. Advocates are calling on opponents to urge their congressional representatives to defend bicycle, pedestrian, and transit funding in favor of a better bill.